Isagenix Thermo GX £ £16.00In stock! Order now! Would you like to jumpstart your metabolism and weight loss?The supercharged Thermo GX was designed to provide the solution! Containing a specially formulated blend of ingredients proven to boost your energy and support a faster metabolism, it’s a perfect all-natural complement to any Isagenix nutritional programme. For more information about how this product works, the ingredients it contains and the results you can expect from using it, download the full product guide here. Why Does Thermo GX Work So Well? 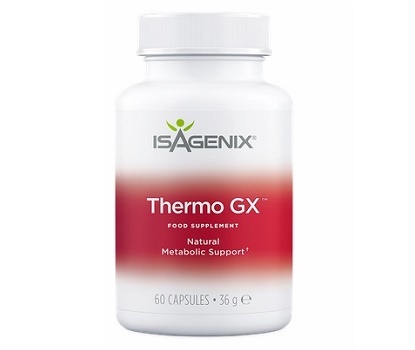 Unlike most metabolic boosters, which only feature one or two ingredients proven to actually work, Thermo GX contains an array of ingredients clinically proven to improve one’s metabolism and overall health. It’s important to note, despite its ability to energise the body and increase metabolic rate, Thermo GX contains no artificial stimulants of any kind and doesn’t cause the anxiousness and jittery feelings associated with traditional energy drinks. Niacin has become one of the most popular cholesterol fighters in recent years. Several studies have shown its ability to decrease triglycerides, lower harmful LDL cholesterol, and increase helpful HDL cholesterol levels. Best of all, when combined with chromium, it takes much less niacin to perform its heart healthy duties. Why is this duo so effective? Well, chromium and niacin have a dynamic synergistic relationship. When combined, cholesterol levels go down, glucose tolerance goes up, and the weight comes off much more effectively than if each were taken alone. The unique ability of cinnamon and cayenne pepper to improve metabolism and boost weight loss efforts has been well-known for quite some time. In fact, each increases metabolic rate and blood circulation, which allows more oxygen to travel through the blood stream and reach the cells. There are other health benefits associated with these spices as well. Meanwhile, cinnamon stabilises blood sugar and reduces blood glucose levels. In fact, one study found cinnamon was able to reduce blood glucose levels by an impressive 29 percent. While you can add these spices to everything from soups and spaghetti sauce to your morning coffee, Thermo GX contains just the right amount of each and delivers straight to your cells via an easy to consume capsule. Plus, Thermo GX has chromium, niacin, and green tea as well to kick your metabolism into high gear. The potent combination of ingredients in Thermo GX makes it an excellent standalone product. However, in order to burn fat faster, increase muscle tone, and achieve the very best weight loss results, it should be taken in addition to exercise and as part of an Isagenix nutritional cleansing and weight loss programme. When combined with IsaLean Shakes, Ionix Supreme, AMPED Hydrate, and any number of proven Isagenix products, you’ll enjoy a leaner, fitter, and healthier you! Isagenix Thermo GX can be purchased for £28.01 per bottle at full retail prices, or sign up with us (UK’s #1 distributor) and pay just £21 per bottle. Each bottle contains 60 capsules. 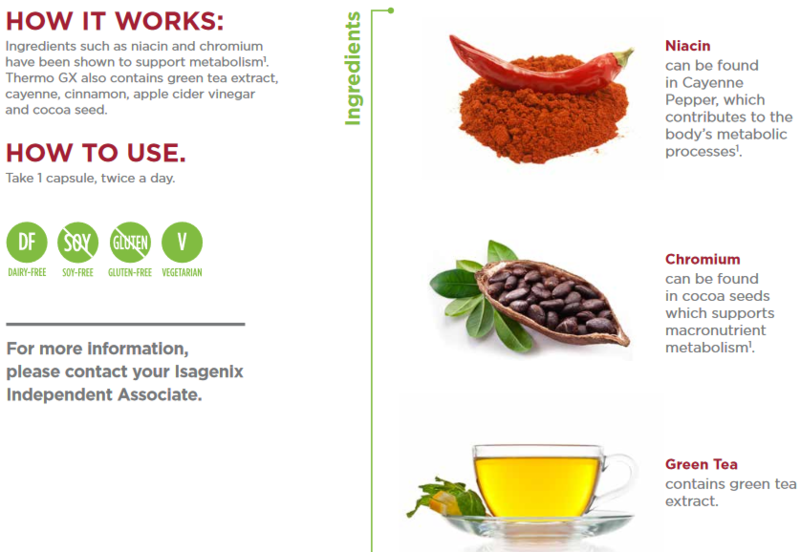 Read Isagenix Thermo GX reviews from real Isagenix UK customers!